hi everyone! i truly hope you are all well and happy. life is ridiculously hectic, but in a very good way indeed. i'm really busy with my new job at sarah raven, which i adore. in fact, right now, i'm sat writing this post in Sussex, as I visit Sarah's farm at Perch Hill - the most beautiful vegetable and flower cutting garden i've ever seen, and the tastiest lunch (oh my word, wild garlic pesto, rhubarb tart with stem ginger cream, viola and mizuna salad, tomato and ricotta cannelloni!). so, life has been treating me rather well, despite the miserable English weather we have been experiencing. my wonderful man and i went to the isle of wight on saturday for the day. we visited the garlic farm to taste chutney and have a ride on a tractor, and the beach hut for a scrumptious crab ramekin with a spectacular beach view (both are definitely worth a visit if you're ever on the island). 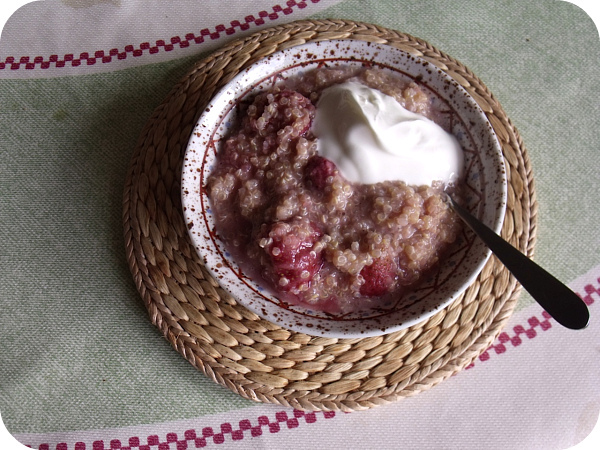 ♥ strawberry quinoa porridge - a great breakfast with a huge dollop of greek yoghurt. i popped some frozen strawberries in with some cooked quinoa and a sprinkle of cinnamon. so good. 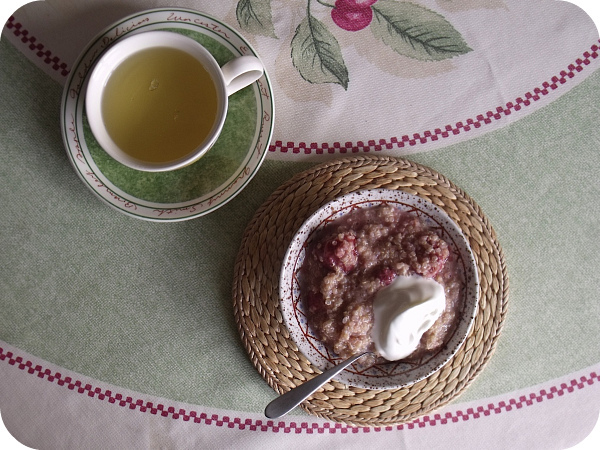 ♥ even better with a hot cup of green tea. 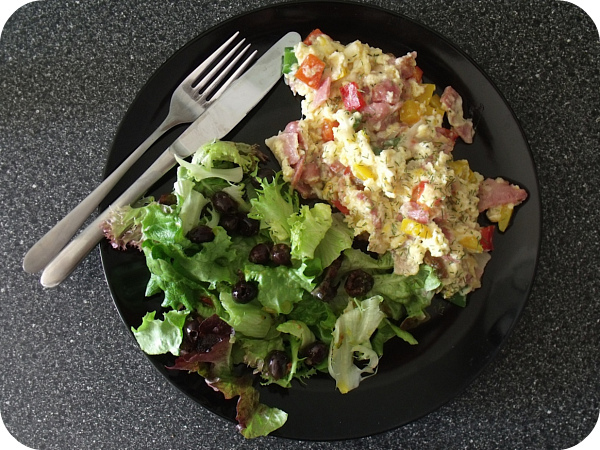 ♥ for lunch i ate a very filling scramble with becon, peppers, dill and an olive salad. 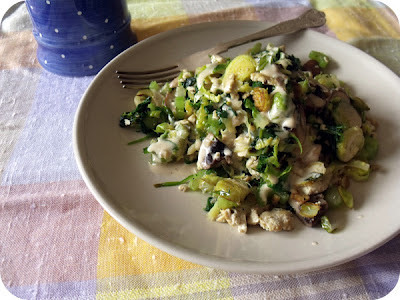 ♥ for dinner, a large plate full of brussel sprouts, onion, spinach, mushrooms and tofu, stir fried in a little coconut oil and topped with a tahini, lemon & honey dressing. OMW (oh my word). ♥ this was seriously good. ♥ a very beautiful view of a steam train going past whilst i was walking Bruno one sunny evening... it even sounded it's horn! magical. and now, for those of you who haven't seen it yet, my latest YT video... here's where i share my favourite things of April with you, including showing off my fave foods :) of course tahini is involved. so, what's new? what are your favourite treats of the season? currently listening to: classic fm - whilst sat in the b&b after a busy day of filming... i am so blessed to have a job i love! 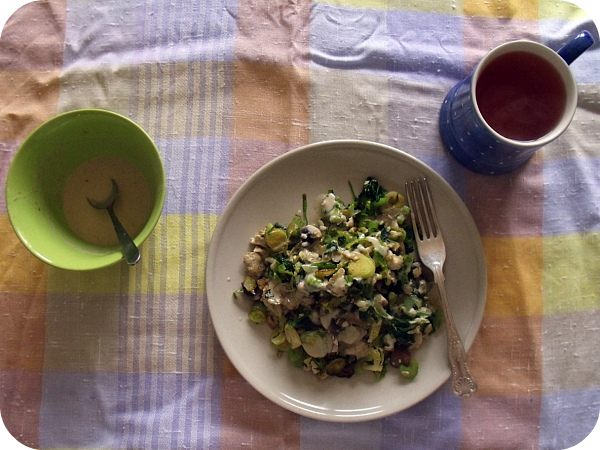 Oh my, tahini and brussel sprouts, I have to try that! I've had tahini on just about everything else already but that sounds amazing! Glad your ok, sounds like you've been having a great time!